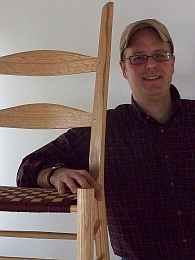 Christopher Nassise is a furniture maker and green woodworker. He builds custom furniture and teaches woodworking classes throughout the year, at his workshop in North Easton, Massachusetts. Chris is a graduate of the cabinet and furniture making program at The North Bennet Street School in Boston, and has a bachelors degree in English Literature from Suffolk University.